This article is about the city in north-east Lithuania. For the manga and/or anime series, see Revolutionary Girl Utena. 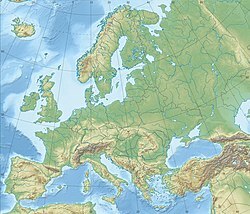 Utena ( pronunciation (help·info)) is a city in north-east Lithuania. It is the administrative center of Utena district and Utena County. Utena is one of the oldest settlements of Lithuania. The name of the city is most probably derived from a hydronym. The name of the settlement has been known since 1261. Utena is an industrial city. It is known for its clothing, food and beverage factories. In recent years, however, streets, public squares and large areas of the parks in the city were reconstructed and Utena is now a more attractive for recreation and tourism. In 2007, Utena won a Silver Award in category B (towns with a population 10,001 - 50,000) of the International Awards for Liveable Communities, held in London. The anniversary of Utena City had been held each year on the last weekend of September. Since 2013 the anniversary has been held on the first weekend of September to take advantage of better weather conditions. 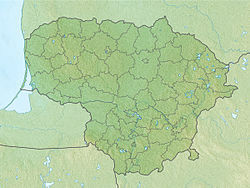 Utena is located in northeastern Lithuania. The city covers 15,1 km² and is the 8th largest city by area in Lithuania. Four rivers cross the city territory: Vyžuona, Krašuona, Vieša and Utenėlė. There are also two lakes in Utena, Dauniškis and Vyžuonaitis. The lowest temperature ever recorded in Lithuania occurred in Utena (-42,9 °C in 1956-02-01). Utena was first mentioned in historical documents dating back to 1261. It was part of the Grand Duchy of Lithuania until 1795, when it fell under Czarist Russian rule. From 1802 it belonged to the Vilna Governorate until 1843 when it became a part of the Kovno Governorate. The town grew rapidly after the St.Petersburg-Warsaw road was constructed between 1830 and 1835. In 1899 a narrow gauge railway line, connecting Panevėžys-Utena-Švenčionys, was constructed. At the end of the 19th century two big fires devastated the town. Germany occupied Utena from 1915-1918, until the Soviet Bolsheviks took over. In June 1919, Utena became a district center in independent Lithuania. Utena, known as the shtetl Utyan in Yiddish, historically had a Jewish population. In 1941, approximately 2,000 Jews were rounded up in the town, which was then under the Nazi occupation and shot in the Rašė Forest about 2 km to the north. FK Utenis Utena plays in A Lyga and BC Juventus plays in LKL. Hometown of Jonas Valančiūnas of the Memphis Grizzlies. ^ a b "Utenos Enciklopedija (English summary)". Utenos Enciklopedija. Utenos A. ir M. Miškinių viešoji biblioteka. 2002. Retrieved 2008-06-30. ^ "Gyventojų skaičius Utenos apskrityje ir savivaldybėse 2005 - 2009 metų pradžioje". Department of Statistics to the Government of the Republic of Lithuania. 2009. Archived from the original on 2011-07-22. Retrieved 2009-03-29. ^ "Gyventojų skaičius metų pradžioje. Požymiai: miestas - Rodiklių duomenų bazėje". Department of Statistics to the Government of the Republic of Lithuania. 2009. Archived from the original on 2011-07-20. Retrieved 2010-01-01. Wikimedia Commons has media related to Utena. This page was last edited on 10 February 2019, at 13:16 (UTC).